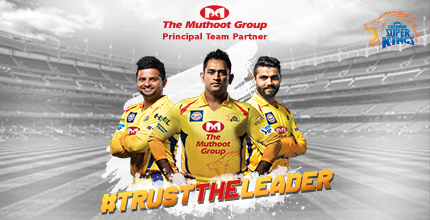 We, at The Muthoot Group, are happy to announce our association with Indian Premiere League (IPL) as the Principal Team Partner of Chennai Super Kings (CSK). As a part of this association for 3 upcoming years, all CSK player jerseys will hereafter carry The Muthoot Group`s logo right on the front. Speaking on the occasion, Mr. Alexander George Muthoot, Deputy Managing Director, The Muthoot Group said, “Cricket is one of the popular and most watched sports in India. With IPL completing 10 years, it has got bigger and better each year. We have always been in the forefront to promote sports and celebrate sportsmanship as we done with several other sports in the past like football (through Indian Super League), Kabaddi (through Pro-Kabaddi League) and also partnered with IPL in their previous seasons (with Delhi Daredevils for 4 years). We, at The Muthoot Group, have been associated with several other sports in the past like football (through Indian Super League), Kabaddi (through Pro-Kabaddi League) and have also partnered with IPL in their previous seasons (with Delhi Daredevils for 4 years).